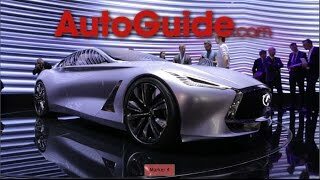 May be the Infiniti in intended to compete with BMW 7 Series and Audi A8 with the release of Infiniti Q80 Inspiration Concept 2014 at the 2014 Paris Motor Show, but whatever the intention are whether to compete or to set new benchmarks for future aggressive luxury cars, they definitely nailed it for the instance. While with the very release of concept officials say the concept is in top of their list curious car lovers are looking ahead anxiously to see, what the final production model comes with. 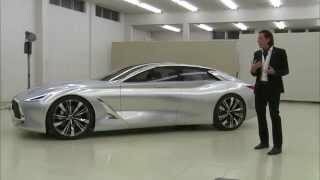 Let us have a closer look at the details of Infiniti Q80 Inspiration Concept 2014. Interior of Infiniti Q80 Inspiration Concept 2014 as per company’s detailing is filled with Carbon-fiber, quilted leather, Alcantara and high grade aluminum. At the release company shared that for this Q80 Inspiration Concept; company has designed bucket seats for all four in car, which they say as ‘1+1+1+1’ sitting format. This makes the interior more spacious and provides comfortable sitting. 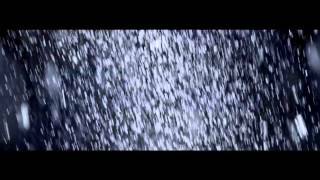 While creating the Infiniti Q80 Inspiration Concept uses acoustic, keeping noise levels low. Talking about tech features inculcated as shared; a heads-up display and simplifies driver interface glorifies front row while for passengers seating behind; they have a personal touch screen mounted over the headrests in front of them. 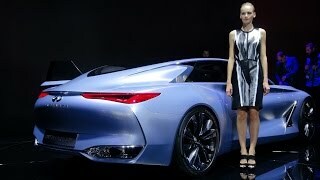 Exterior of Infiniti Q80 Inspiration Concept 2014 is definitely company’s lap ahead in terms of design. Shaped like a coke-bottle it falls over the front wheels, down past the side vents while the rear portrays haunch-rise right over the rear tires. To us the front fascia portrayed luxury while the rear splattered aggression molded with in. Let that be chrome covered quad-exhaust pipe or five dual spoke designed light weight alloy 22” wheels, Infinity undoubtedly nailed with this concept design. We believe if the company comes with the production model carrying 75% of this in exterior, we’ll have a new eye-gainer on streets marking standards of luxury. 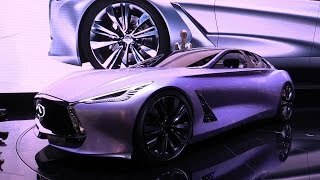 Talking about the beneath the hood aggression, Company shared that Infiniti Q80 Inspiration Concept will come with a 3.0 Liter V6 engine and an electric motor (unspecified detailing). However as shared Q80 Inspiration Concept will have a total power of 550 HP packed through beasts packed beneath its hood. Infiniti also shared the engine will be paired to ‘smart drivetrain’ through rear wheel and all wheel drive system. The selection of these is in the hand of driver and the ‘smart vehicle’ depending upon the conditions.